That’s what we do on Pinterest, the online pinboard. It’s your personal bulletin board of all of your favorite things. Only your personal choices are not so private. You show them to the world – or at least Pinterest members across the globe. And you see all of their boards as well. Need a party favor, suggestions on how to wear your hair, gardening tips, or want to know the newest fashion trends? Check it out on Pinterest. It is so much easier and more focused than a vast internet search. You will see what other pinners found on their treasure hunts, cutting your research time considerably. My daughter, Erin, introduced me to Pinterest a few months ago. Honestly, at first I didn’t get it. Why would I want to spend my precious time looking at photos of home decor and pastries and showing them to other people? Now I say why wouldn’t I? The assortment of ideas I see courtesy of other pinners sparks my own line of thinking. I’m drawing on the creativity of people all over the world and I love it. I also enjoy building and looking at my own boards and sharing my favorites with other members. You can pin anything you find online, from someone else’s board, or a personal photo or scan you uploaded. There are some pinners who I follow and often repin their pins. I may not know the original pinner but feel a bond with those who share common interests. It is a new way to connect with and tap into people you’d otherwise never meet. Pinterest also serves as a means for marketing to a whole new audience. I pinned book covers of the books I’ve written on one of my boards and was surprised to see how quickly they were repinned. Pinterest does have some concerns though, especially in regards to copyright violation. Particularly when it comes to photos and artwork, artists’ works can be copied, reprinted, or duplicated. My feeling is that all artwork posted anywhere online should have a watermark, © symbol, or at the very least, be uploaded at a low resolution. This offers some assurance that the placement of art anywhere on the internet is more of an opportunity for marketing than for someone to steal their work. It’s easy to join Pinterest. Simply apply and wait for an opening or ask a friend who’s already a member to offer you an invitation. 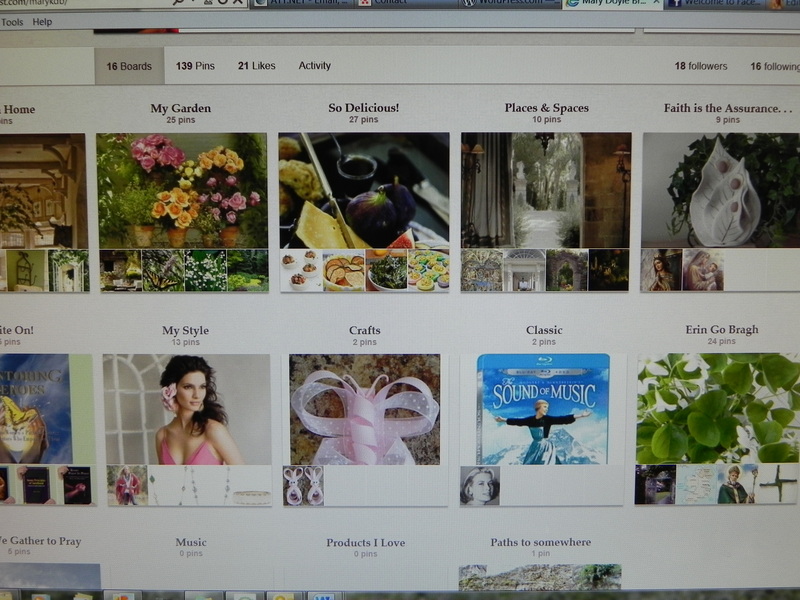 Check out my boards (Mary Doyle Brodien) and happy pinning.